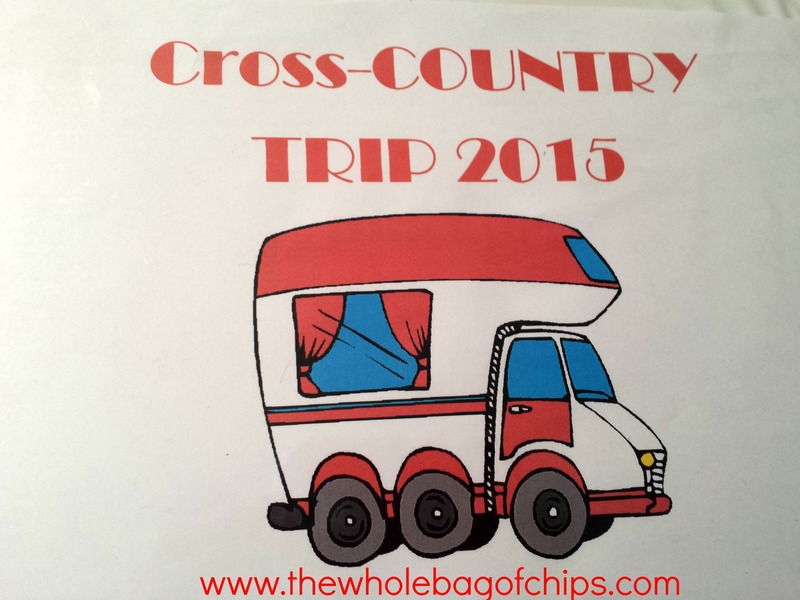 If you are a long-time reader of The Whole Bag of Chips, you know that we took an amazing trip all over the country during the summer of 2015. In 34 days we visited 29 states, and we got to see many family and friends as well as lots of fun landmarks and locations. Along the way we learned a lot about RV life, what we liked, what we didn’t like, and how it all worked. We learned that we loved traveling with an RV and we all agree that this was a trip we’d do again if we ever had the chance. As we traveled, I kept everyone posted as to where we’d been, week by week, through weekly articles printed in our local newspaper, The Cranston Herald. In between each article, I’d post blog posts that detailed some of the tips, tricks and organizational methods we were utilizing along the way. I also posted early on about the brief overnight trips (only two!) that we took after buying the RV so that we could get to know the space and how everything worked. Now that the trip has passed, I thought it would be a great idea to keep all of the links to all of the posts in one spot, so I’ve created this page. I am going to link them in order from oldest, going back to the very first post, to newest, going back to our final article summarizing the trip. It’ll be a great way for you, and for us, to find everything all in one place. See the big trip announcement here. July 1: Read the back story about our trip and how it came to be, here. This is the first Cranston Herald article in my series of seven. July 3: See some of the preparations we did before our maiden voyage, here. July 6: The things we didn’t know we didn’t know…see them here. July 7: Read all about our first trip out in the new camper here. July 8: The second article in a series of seven about our trip, “An early start and a taste of the south,” featured in the Cranston Herald can be found here. July 10: Looking for packing tips and tricks to stay organized in an RV? See ours here. July 13: See the first in a set of two posts about our trip binders, one for kids, one for mom, here. July 14: Mom’s binder wasn’t quite as exciting as the kids’ binders, but you can still read about it here. July 15: The third article in the series about our trip, “Into the west and through the Lone Star State,” featured in the Cranston Herald can be found here. July 20: We got to try out a great new BBQ set while we were away. You can read about it and see one of our campfire meals here. July 21: If you’d like to read more about how we cooked and what we ate on this trip, you can do that here. July 22: Wild West: You can read the fourth Cranston Herald article in the series of seven about our trip, “Wild West: The OK Corral, Grand Canyon and beyond,” and see some of the fun stops we made out west, here. July 27: Want to plan your own trip? Here are some things to keep in mind when you do. July 28: There are some things you might not think to take on your trip. You can see a list of them here. July 30: We took on Hollywood and the Los Angeles area when we visited our family there. You can read the fifth article in the Cranston Herald, “The Cowarts go to Hollywood,” here. August 6: Would you like to watch an 8 minute video that our daughter created while on our trip? If so you can see it here. August 6: The sixth Cranston Herald article featuring our trip to Yellowstone National Park and Mount Rushmore can be read by clicking here. August 13: The seventh and final installment in the Cranston Herald series, “The long road home: SD to RI in five days,” can be found here. If you thought the last four weeks were an adventure, wait until you read about all the things that happened during fifth week and our trek home! August 21: We brought this great homemade brownie mix on our trip with us and we’ve been using it at home since we got back too! You can see it here.